I was about ten years old when I stumbled across an unfamiliar CD in my uncle's catalog of discs he kept in his room. Out of all of the Spanish Rock, Pop and R&B albums, this one particular case stood out from the rest; the album cover had a man dressed in black and his name was unpronounceable at the time. Out of curiosity, I popped the CD into my boombox and it was then that I was introduced to the melodic beats of Trance. The song was called Tell Me Why, and it was by none other than legendary DJ Paul Van Dyk. At that age, I had no idea what I was listening to. Growing up in a Spanish-speaking household, I was surrounded by predominantly Spanish music and the occasional top 40 English radio songs. I knew this was different, however, and even though I had no clue what genre of music this was, I knew I liked it. It would take another five years before Trance entered my life again, but this time I genuinely fell in love with the beats that entered my ears, Tiesto's classic, Adagio For Strings. It has been ten years since I discovered Tiesto, and since then I have finished college and have taken my first steps toward my professional career. In those ten years, Trance had become dormant in my life; while electronic music continued to evolve all around me, I stayed focus on my college and career goals. Dreamstate: Trance Heaven. One of the many Trance-themed totems at Dreamstate SoCal. Dreamstate was introduced in 2015 as Insomniac's first all-trance event and its inaugural two-day event sold out in the first four hours. I was unable to attend the first-ever event at the NOS Center in San Bernardino, but seeing how big the demand was, Insomniac quickly secured a second event only two months after its first, this time in San Francisco. As fate would have it, I happened to be working in the Bay Area the same weekend Dreamstate SF was taking place. My first Dreamstate experience in San Francisco was an amazing one so I had high expectations for the one-year anniversary of their original event in San Bernardino and Insomniac did not disappoint. This year's Dreamstate Southern California event also took place at the NOS Center, however, they expanded their footprint and included four stages instead of one which lead to some big inconveniences but some even bigger surprises. While the overall two-day event was great, there were a few misses. A screenshot of conflicting sets from the Dreamstate App. How do you choose? The biggest inconvenience for me throughout the weekend was the set-time conflicts. In San Francisco, Dreamstate was held at the Bill Graham Civic Auditorium. The 100-year-old historic venue has a single stage with a huge standing room floor and a balcony, this meant that all of the DJs would perform in one stage so you would not miss your favorite artists and had different experiences in viewing the show (the balcony had amazing views of the lasers and light show). Throughout 2016, the popularity of Dreamstate has increased and it is understandable for Insomniac to capitalize on the demand, however, after experiencing an intimate setting in San Francisco, I was upset to know that I had to choose between Cosmic Gate, Standerwick or Infected Mushroom on day one. Or Vini Vici, Ben Nicky and MaRLo on day two. This also meant you had to walk from stage to stage in order to catch the upcoming DJs, which is not a big issue if you like to wander around, but I like to enjoy a trance set to its fullest and that was not achievable most of the weekend. My friends and I in front of one of the few decorated spots at Dreamstate SoCal. My second (and last) gripe I had at this year's Dreamstate is the lack of creativity Insomniac poured into their trance-only event. Every time I attend an Insomniac event, I am transported into another world. Just last month, Escape: Psycho Circus (also held at the NOS Center) had me watching a freak show under a massive circus tent, wrapped my body in a straight-jacket and made me walk through a haunted maze and had plenty of roaming performers throughout the venue ready to give you a fright. Dreamstate, with their utopian/otherworldly promotional flyers, failed to transport me elsewhere. The main entrance banners only had the usual “ID Check” and “VIP Entrance” but once inside, only lights decorated the trees surrounding the lake at the entrance to the NOS Center which doesn't really scream out utopia to me. While they did have a few roaming performers throughout the venue, I would like to see the creativity that Insomniac delivers into EDC, Escape, Beyond and Nocturnal Wonderland at Dreamstate. With that being said, where creativity failed, music delivered. Dreamstate had the biggest names in trance music, spanning from the 1990s to today and it was pure trance heaven. Highlights from day one include Jason Ross, who delivered classic Anjunabeats and Jorn van Deynhoven, whose entire set had me on my feet with the familiar melodic beats and soft breakdowns with big drops. Aly & Fila had an unreal set that blew my mind, and that flowed perfectly into Andrew Rayel's set. My personal favorite moment of day one has to be Gareth Emery's closing set; nothing compares to the feeling you get singing along to his big hits surrounded by your Trance Family. A crowd outside of the Citrus Building where Astrix and Ace Ventura were playing back to back. Day two of Dreamstate had a gloomy start. A storm was moving through Southern California that day, but it dried out just in time for the festivities to begin, although it was a bit chilly. If there was ever a day to be a trance fan, this was it. Dreamstate delivered a massive Psytrance punch on Saturday. Vini Vici's set was a standout with his non-stop psytrance tribal beats that kept me dancing throughout the entire set. Ace Ventura also delivered a knock-out performance as did Astrix. The demand to see these psytrance heavy-hitters was so high, security had to close down the entrance until crowds inside diminished. Paul Oakenfold and Paul Van Dyk each produced an incredible set, both of them immediately took me back to when I was first introduced to trance music and fell in love with the uplifting feeling. However, it was Ferry Corsten's Gouryella set that transported me into another world. It was a great way to close out Dreamstate. The production value that each stage delivered was first-class, as expected from the Insomniac team. Each stage was packed with plenty of lasers and huge LED screens as well as top-notch sound systems. I was a bit underwhelmed with the layout of the main stage, though. After seeing the insane laser rings that debuted at Dreamstate Australia earlier this year, I was excited to see what kind of design the main stage would have (maybe even bring the massive circular rings to So Cal?). Unfortunately, the rings did not arrive, but the stage was still pretty impressive with a huge LED wall behind the DJ booth. Trance fans celebrate Dreamstate SoCal. One striking difference that must be noted is the crowd that Dreamstate brings. Having attended many music festivals, Dreamstate is the only one that calls on trance fans throughout the world. Because of that, you experience a different type of rave than an all-encompassing massive like EDC. Dreamstate brought out generations of trance lovers who had nothing but positive vibes and genuine love and excitement for the genre. That lead to the most respectful crowds I have encountered at a festival, truly living out the PLUR name. It was because of these positive vibes and love for trance music that I was able to experience a bit of the early years of the rave scene. I was too young to explore the underground rave scene in its heyday, but being at Dreamstate (especially inside the buildings that recalled massive warehouse parties), I truly felt as if I had traveled back in time and was surrounded by the pioneers of trance. Overall, Insomniac did a spectacular job in producing their first anniversary of Dreamstate SoCal. Not only were you able to sing and dance along to your favorite trance DJs from the 1990s and early 2000s, but you were able to do it with a crowd that understood your love and connection for the genre and that is something truly magical. Dreamstate is still in its early stages, however, its immense popularity has it already growing to other places throughout the world (San Francisco, New York City, London, Mexico City and Melbourne) and shows no signs of slowing down. Now that we have had a taste of what a two-day, four-stage Dreamstate event can deliver, I would only suggest bringing the level of intimacy that I found in San Francisco and to truly deliver on transporting us into a Utopian world. 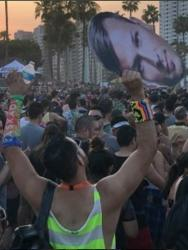 One of the many Trance-related totems found at Dreamstate SoCal.